You have the option of either a classic English or Asian themed afternoon tea at the Ting Restaurant at the Shangri-La Hotel London. 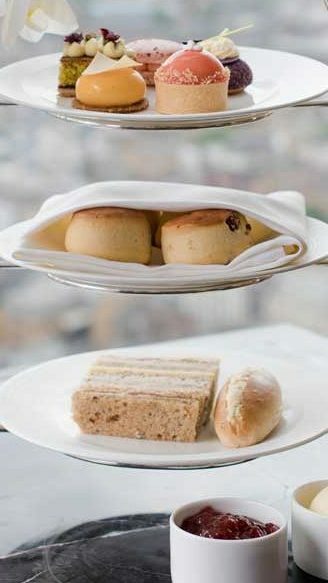 High Tea Society had the pleasure of reviewing two impressive afternoon teas at Ting, located on the 35th floor of the Shangri-La Hotel in London’s iconic Shard. 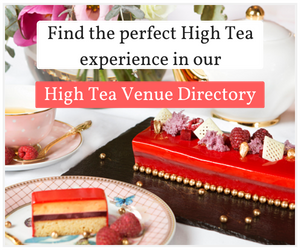 A classic afternoon tea is available for those who enjoy the traditional menu while those fancying something different can choose the Asian-inspired offerings. But first the view, for if you’re going to visit the Shangri-La, those views are hard to beat. Sweeping into the 35th floor and getting your first hit of the views, with St Paul’s cathedral as that first jaw dropping panorama, you make your way around to Ting and get settled in to gawp down below. Ting is decorated lounge style and there are comfortable low loungers and sofas, all the better for you to settle in for a few hours. 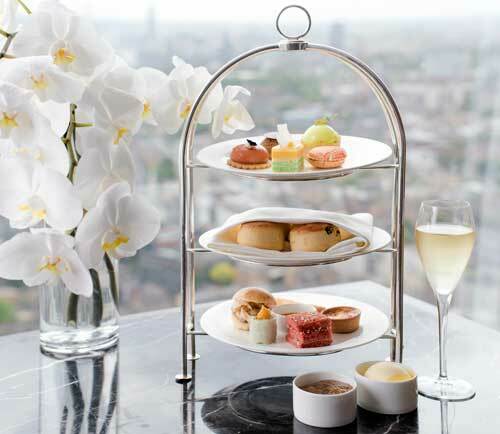 Ting offers an option for each person to choose a different menu so it makes sense for us to have both the English afternoon tea as well as the Asian inspired afternoon tea. It should be said that if you are vegetarian, then the English afternoon tea is your only option as that will be easily changed to include vegetarian options. We were also offered a plate of the non-vegetarian sandwiches so we could try out all the offerings alongside a plate of the vegetarian sandwiches. We were very impressed with the range of vegetarian sandwiches as they included flavours a touch above standard fare and included Moutabel, Aubergine, Duck-egg mayo, Hummus and Mozzarella and Pesto. The usual non-vegetarian selection of sandwiches were equally delicious with a Smoked Salmon, Roast Angus beef, Honey Roast ham, Duck-Egg Mayo with truffle and a Cheddar and Piccalili number. These were all freshly made, soft and delectable without being too heavy or full. Being a big fan of Asian food though, my heart was swayed by the Asian-themed savouries on offer. The Rendang beef Brioche bun was a close contender for favourite as was the Crab tart served with a ginger and sweet chilli dip but then there were no losers in this line-up which also included beetroot cured salmon with sesame and yuzu on rye and a duck mango rice paper roll. We had opted for our afternoon teas along with a glass of the Veuve Cliquot champagne and it was the perfect accompaniment to the savoury selections, both Classic and Asian. For the scone course, we each chose a cup of the Earl Grey tea with Orange and our friendly waiter agreed it was one of the best options as the orange inclusion in the Earl Grey elevated it to become something special. He definitely knew what he was talking about and it was a sure fire hit. The Asian-inspired tea came with Gooseberry relish while the English tea came with the Strawberry jam and clotted cream of course and the scones were just the right level of soft and crumbly. I couldn’t give the scones my full attention though because the pastry selection was calling. Each morsel of the pastry selection was better than the last with my Asian tea featuring a Vietnamese coffee choux bun, gooseberry tart, Pandan gateau, mango passion macaron and a pink guava mousse although if I could possibly fit in seconds, it would probably be of the pink guava mousse, which our waiter also confirmed as his favourite. The classic selection was equally as good with a Cherry pistachio financier, cassis and violet choux bun, apricot lavender mousse, rhubarb ginger crumble tart and a raspberry rose lychee macaron and I think once again, I would vote for the mousse as the favourite although I can’t levy a single complaint against any of them! 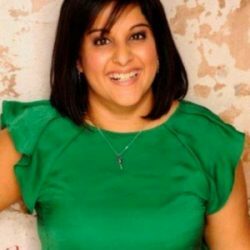 The service throughout was extremely friendly and not at all hurried, they seemed happy for us to linger on with tea refills for as long as we liked and it was only the thought of exploring neighbouring Borough Market that really enticed us to leave at all! 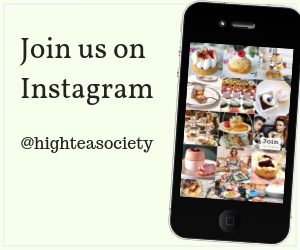 *A gluten free Afternoon Tea option is available with advance notice. If however, you really don’t want to leave (And we don’t blame you), you can now Enjoy ‘Summer in the City’ at Shangri-La Hotel, At The Shard, London. This experience includes an overnight stay for two in a luxurious guestroom or suite, bottle of house champagne served in room upon arrival, a delicious afternoon tea to be enjoyed in the privacy of your room with captivating views over the capital, complimentary WiFi, complimentary use of the gym and the infinity Skypool, and English breakfast served in TING restaurant and lounge, located on the 35th floor. The offer starts from £615 for one night based on two people sharing a room. 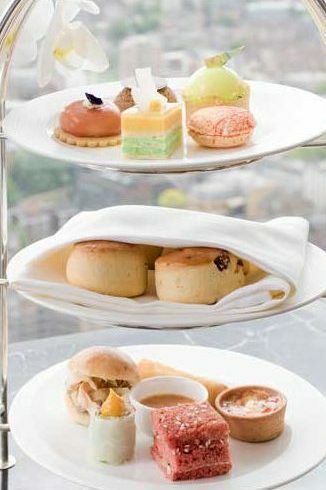 English Afternoon Tea is priced at £56. South East Asian Afternoon Tea £58.